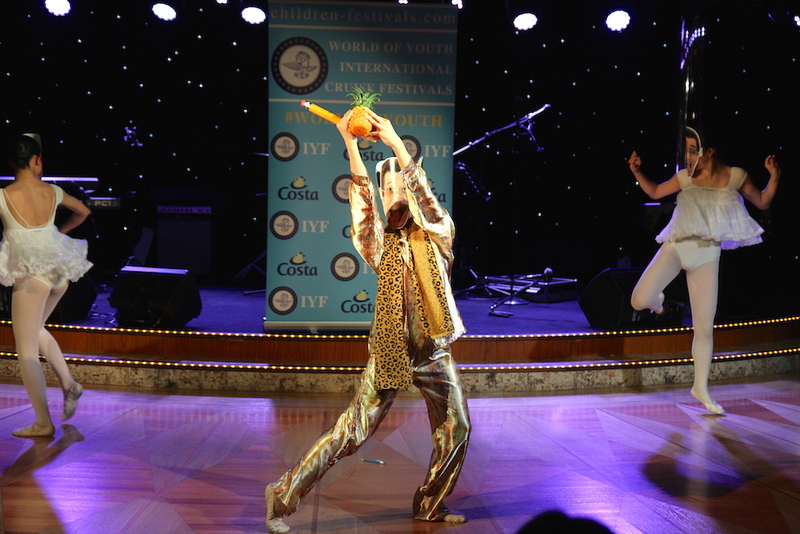 The XI Cruise Festival “World of Youth” was held for the first time on the Costa Diadema cruise ship. 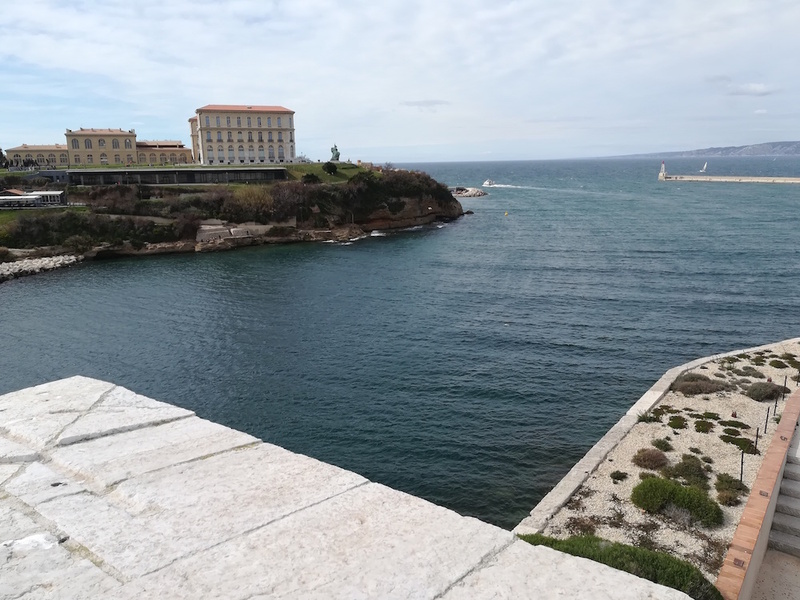 1 Day 08.03 The teams from the distant regions had the opportunity to relax in the beautiful hotel of the port of Savona right on the Mediterranean coast. This allowed not only to gain strength before the festival, but also to visit the Saturday market with a lot of souvenirs, exotic flowers and food. 09.03 after a rest and a pleasant walk registration on the liner began. The interior of the Costa Diadema is distinguished by its original design with convex hemispheres the color of the sea from the reception to the very top, surmounted by a glass roof dome. Immediately after registration, all participants waited for lunch. The abundance and variety of cuisine is designed for every taste and any diet. It was pleasant during lunch to enjoy the view of the sea and the coast through the panoramic windows. 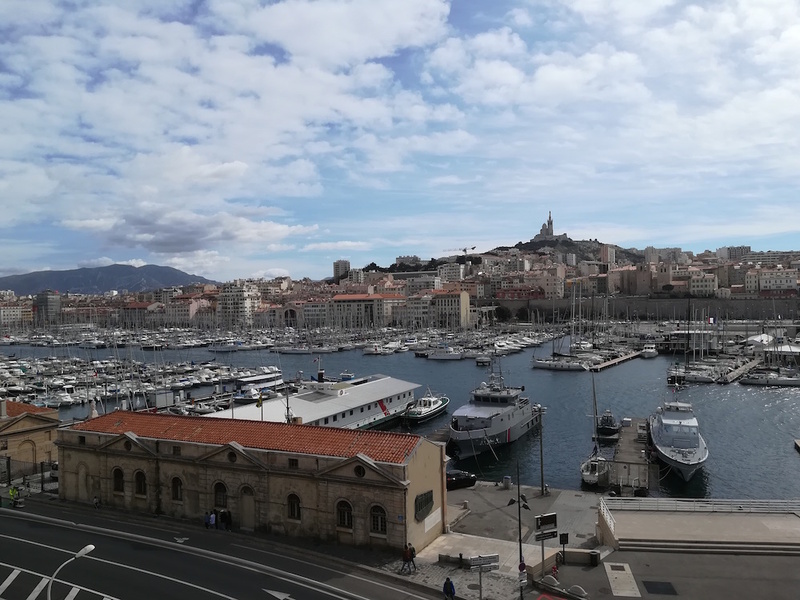 10.03 Arrived in Marseille, the sea capital or the gate to France. It was a surprisingly sunny day. Beautiful weather 20 * C and blooming peach trees. Pleasure trains allowed to drive around the whole center and visit the famous Church of the Navigators, enjoy the views of the port, Castle If, ​​the Palace of Lonshan. 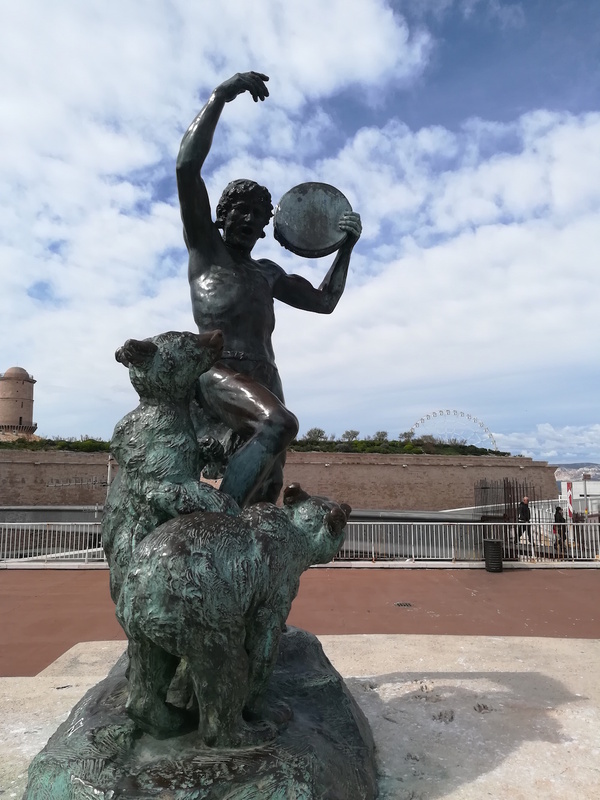 The most important discovery is the new museum of the history of Provence and Civilization, which was opened in the fortress of the port. Within minutes you can get acquainted with the history, battles and outstanding people of Provence thanks to a short video. And all this against the backdrop of stunning views of the bay and the city with magnificent seating areas. In the evening, groups were waiting for each group presentation. 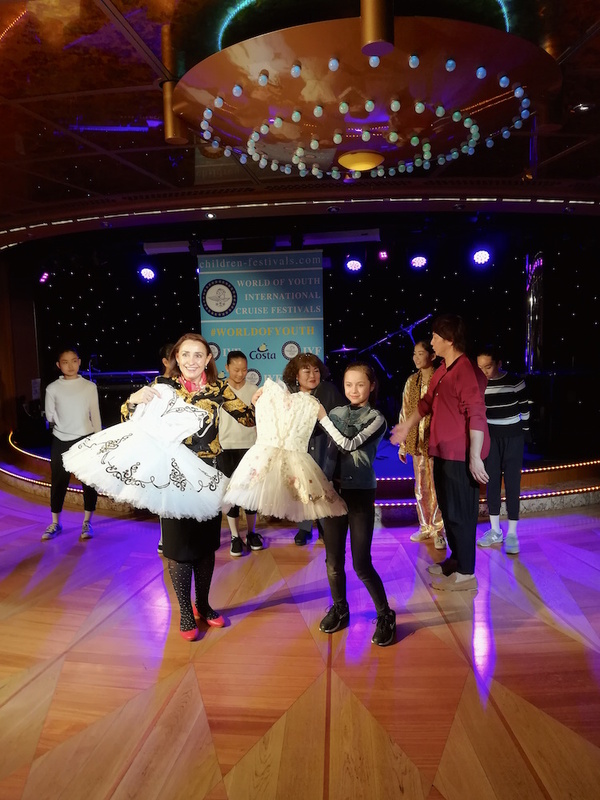 It was fascinating: comic dance of the Japanese delegation, teaching Kazakh dance elements from Astana residents, Russian “Kalinka” children from Severodvinsk, youth dance from Samara children. 11.03 Barcelona – the southern capital of Spain (Catalonia) or the city of dreams and Gaudi. Of course, everyone went on an excursion to the Old Town to the church of Sagrada Familia. 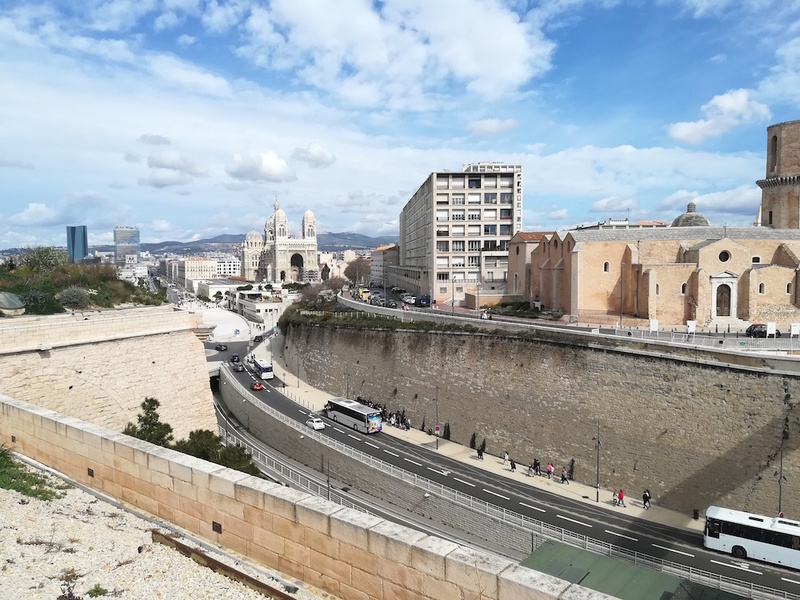 And those who have repeatedly visited this beautiful city, took the cable car and climbed to the gardens of Montjuic or went to the Park Güell. After the return, the theater stage was given to the participants of the festival for rehearsals. The day of the competition was approaching and it was necessary to prepare well. Well, in the evening there was a “white party” on the main deck: everyone was in white, and only multi-colored balloons soared under the transparent roof of the liner. 12.03 Palma de Mallorca – an island of fairy tales and mystics. The cathedral keeps many secrets. Here everything is mysterious: from the frescoes and their location to pumpkin ships Gaudi. You fall in love with this island forever. In the evening there was final preparation before the competition. Gala dinner with dancing and singing waiters, ice-cream cake with candles and an Italian show in the theater. 13.03 Day at Sea and competition. The fight broke out in earnest. “Uly Dala-Kasac” – Merey (Kazakhstan) was technically challenging and stagely dynamic. The jury rated this number with high balls. It is time to see what the Japanese School of Dance World made in Takane, from Tokyo, will introduce. It was a real astonishment to see the synchronous movement and the magnificent choreography on the chairs with the wheels. The spirit was exciting when the dancers presented “Star Spin”. Unexpected and not repeatable. The magnificent work of choreographer and performers. In the fight entered the girls Russian Ideas. Impulsive and emotional number “I love you” using parts of outerwear, which turned into a wall, now into fatal rain, or into a shot-fated fate. Impeccable technique of performance, strong performance and high points of judges. “Vanki da Manki”: a technically challenging dance, with an amazing idea of ​​using baskets in the form of baskets and hats. The performance of the number “Dolia Tjahzolaia Muzhskaia” (“Tough men’s destiny”), excellent performance and artistry, humor, temperament and originality are rated the highest points. The jury remained in admiration of the production. High professionalism of choreographers and performers is noted. And it seemed no longer possible that someone would get the highest score. 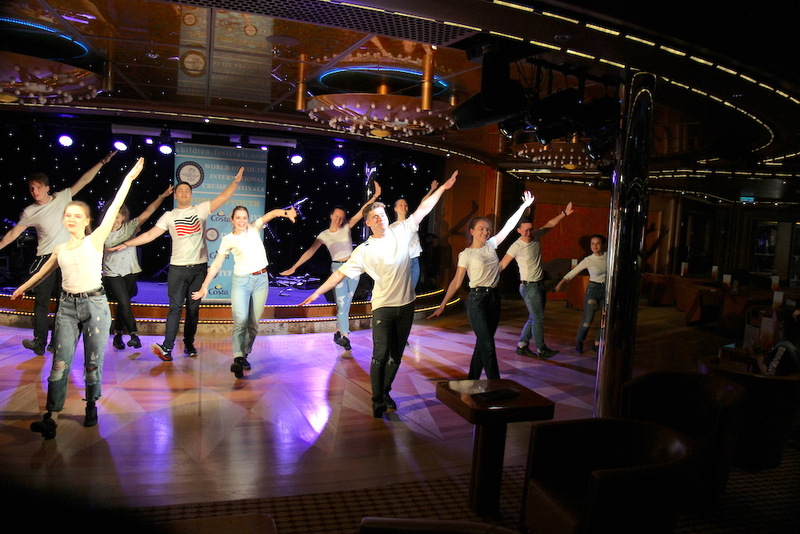 But the climax came when the dancers Takana (Tokyo) showed the number “Dear Costa Diadema”. The idea in the dance is to use a mini trampoline, and to this the ease of performing the most complicated tricks with elements of gymnastics in combination with dynamic energy, lifted the whirlwind; The number completed the reincarnation of the mini trampoline in the Costa logo. Bravo to choreographer Mr. Takane! Laureat 2 – Zolotica (Russia) – “Once on a Cruise”, an original number, with good soloists and dramaturgy. 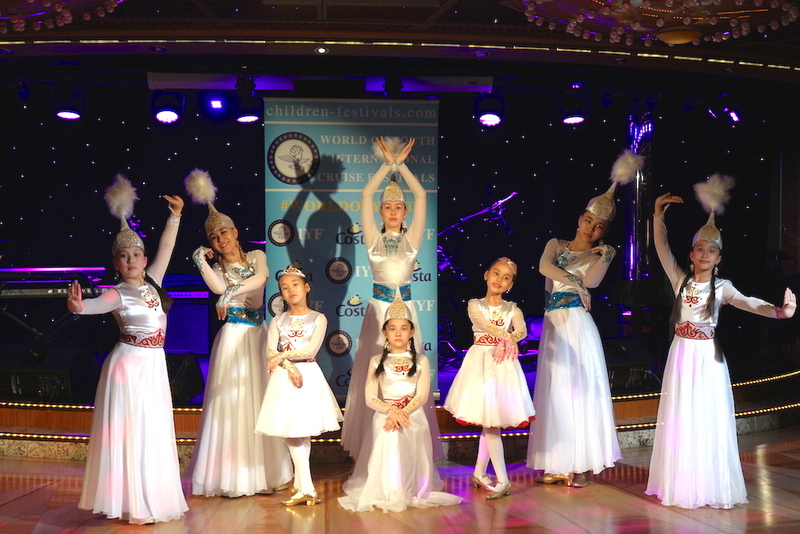 Laureat 2 – “Merey” (Kazakhstan) – “Chines Dance”. Bright colorful dance with scarves in the form of flowers. Difficult in possession of the subject, performed at a high level. This number scored enough points for the 1st Laureate and could qualify for the highest rating if there were no such strong competition. Laureat 1 – Princess Aurora and Esmeralda performed by Dance World made in Takane (Tokyo, Japan). The most difficult thing for the jury was to determine who should give the jury prize, because Each member of the jury had a favorite. The jury could not resist the recommendations for the soloists Dance World made in Takane to try themselves on the best ballet scenes of the World. And members of the team Zadumka (Russia) were invited to the professional casting Costa. After an intense competition, there was a short break for lunch and rest. 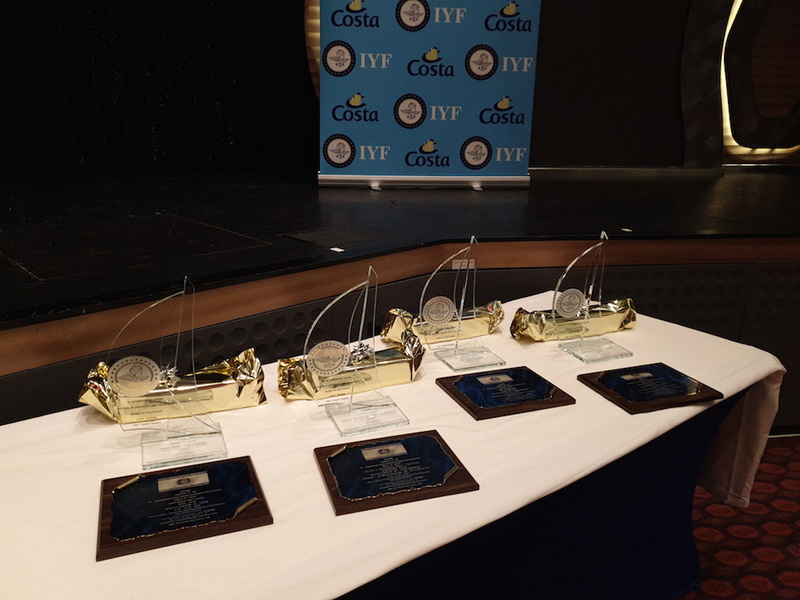 The festival organizers experienced because The gala concert of the winners of the festival “World of Youth” on the Costa was for the first time. Announcements and announcements have collected a full audience. The hall with 2,000 seats was completely full. And as the audience met and accompanied the young talents, defies description. It was a concert of real STARS that many professional artists could envy. Emotions overwhelmed everyone! The evening continued on deck 11 in a crystal disco with panoramic windows, overlooking the sea and the moonlit path. 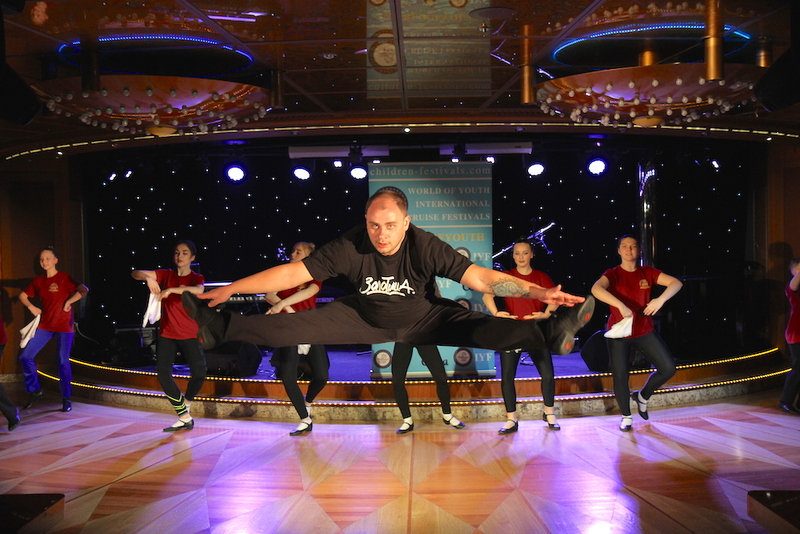 Disco under the stars on the fast-going sea Liner is an incomparable impression. 14.03 Palermo. Excursion – a gift to winners. The guide Svetlana, a real marquise (she is really bearing the title of the marquise), introduced in detail the history, architecture, showed the theater, where the stage is larger than the auditorium. She told about the Jesuit Order, where the most important thing is education and recommended to gain knowledge in order to sell them at a profit. It was noticeable that Svetlana, many people know and she knows a lot about the manners and character of the Sicilians. The Cathedral is a handsome and meke for tourists crowned the end of the tour. And for dessert, dinner on our ship filed rolls Kannoli – Al Pacino’s favorite delicacy. This evening was the birthday of the head of Zolotitsi – Elena Vantrusova. She was solemnly congratulated in the restaurant with a birthday cake and the song “Happy Birthday” from all the waiters and participants of the festival. The celebration coincided with the evening of the captain. General fun, aria of Italian tenor and champagne for adults. 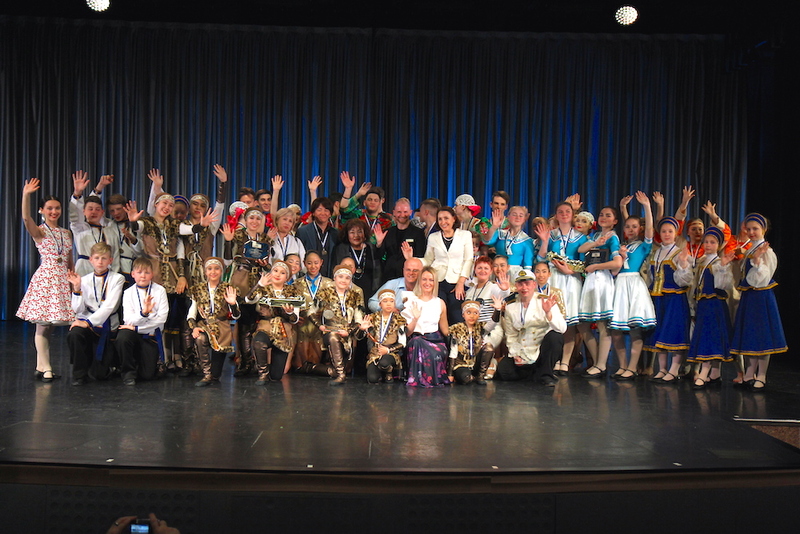 A concert of the best numbers of the “World of Youth” festival was planned in the main theater. But by general agreement of the participants of the festival, this evening was held as a concert Dance World made in Takane (Tokyo, Japan). The audience stood up to the winners and reacted violently to each number. 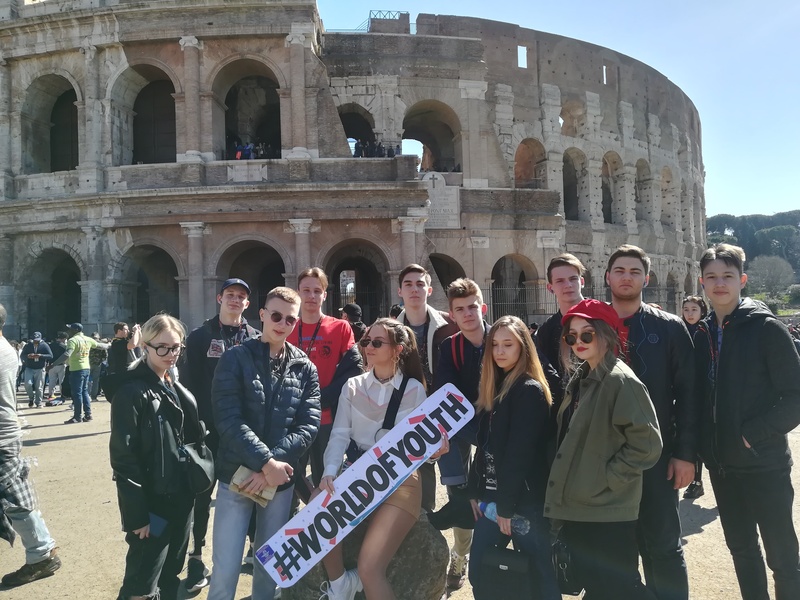 15.03 – Rome, and that says it all. Apogee of educational and cultural programs. 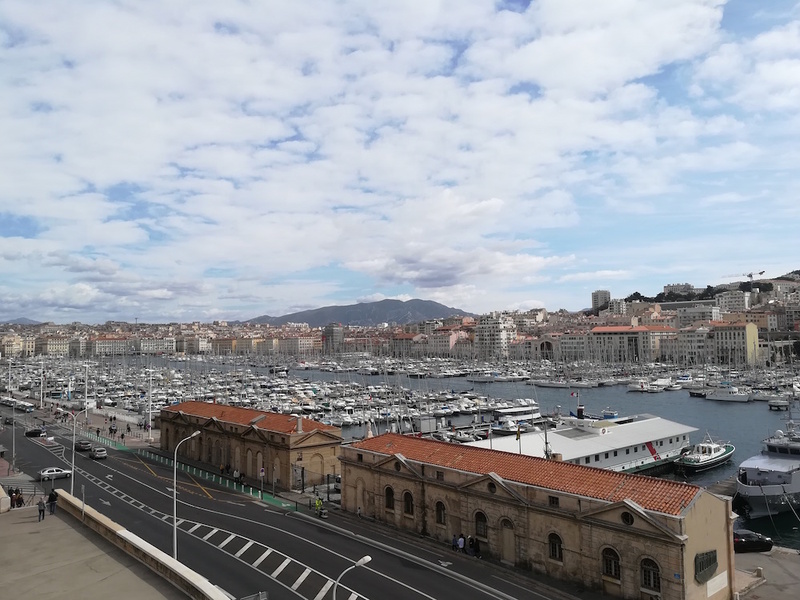 The weather was also lucky, about 20 * C. But those who, already in Rome, were and wanted to enjoy the liner, devoted the last day of the festival cruise to relaxation. You could sunbathe on the decks, visit the Spa or soak in the jacuzzi overlooking the sea or the beautiful beach, try exclusive drinks, desserts or Italian Crespell pancakes, which are prepared before your eyes. Jogging or fitness on the upper deck is a separate pleasure: the sea breeze, beautiful views and the gentle sun. In the evening there was a VIP dinner for executives. The festival organizers thanked the leaders of the groups for their wonderful children and magnificent performances, for the highest level of youth creativity. With their art, the festival participants attracted the attention of numerous viewers to the dance of their country. The leaders said that it was interesting for them and the children to participate in such a festival and everyone is happy! 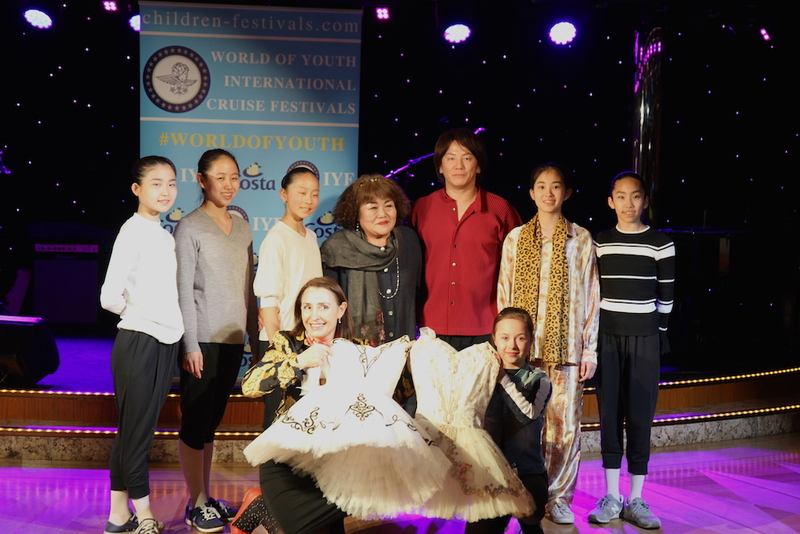 The honored guest Mrs. Yoshino wished everyone further development in the work and presented the organizers with 2 tutus to award the best ballerinas of the future festivals. The evening ended with a performance: “Zadumka (Russia) -“ Dolia Tjahzolaia Muzhskaia ”(“ Tough men’s destiny ”) on the main dance floor surrounded by thousands of spectators. It was a worthy point to complete the XI World of Youth cruise festival. 16.03 Arrival at Savona. Rich breakfast and Goodbye Costa Deadema! Up to the new cruise festivals World of Youth!